—this being based on molecular and morphological lines of evidence (Wood & Borkent, 1989; Whiting, 2002; Simiczyjew, 2002; Beutel & Baum, 2008); although this conclusion is still open to debate (Wiegmann et al., 2009; Beutel et al., 2010; Friedrich et al., 2012). Even if we take Mecoptera to be a valid taxon, it cannot be denied that it exhibits considerable phenetic variety for an order of comparatively low specific diversity: from the Nannochoristidae, which by their aquatic elateriform† larvae (Fraulob et al., 2012) are so distinctive from other mecopterans as to have resulted in arguments that they deserve their own order (Hinton, 1981); to the infraorder Raptipeda, its long-legged members distinguished by their lone and unpaired tarsal claws (Liu et al., 2014); or the flightless leaping Boreidae, constituted by two greatly divergent subfamilies (the Caurininae—see above—"arguably one of the most bizarre and cryptic ... endopterygote insects"; Beutel et al., 2008) that are nonetheless united. Nor let us ignore the extinct Aneuretopsychina, a suborder that with their suctorial mouthparts appear to have been pollinators of flowering Mesozoic flora that predated angiosperms (Labandeira, 2010). Within the bounds of this post, I will detail only two mecopteran families that happen to be similar in their peculiarities, forming yet another distinct morphoecological facet of that order: the Meropeidae and Eomeropidae, which may (Whiting, 2002) or may not (Penny, 1975) possess an actual phylogenetic relation. The Meropeidae are the more diverse of the two, albeit with only two extant genera: Austromerope (containing one species in Australia and another in the Brazilian mâta atlantica; Machado et al., 2013) and Merope (monotypic and precinctive to eastern North America; Byers, 1973). Meropeid males are unmistakable in their possession of scythe-like jointed terminalia: these forceps (presumably utilized in copula) have earned them the vernacular name of "earwigflies", due to a perceived likeness herein to the unsegmented cerci sported by both genders of Dermaptera (Somma & Dunford, 2007). Earwigflies are not distinctive for this alone: what with their flattened profile, ornate wing venation, opisthognathous‡ head, and castaneous coloration the family is utterly unlike any sympatric mecopteran. These features correlate with earwigflies' nocturnal and ground-dwelling habits—unobtrusive customs that have foiled attempts to study their biology; the fact that adults stridulate by rasping the jugum§ against thoracic serrations (Sanborne, 1982; Dunford et al., 2006) is really the only detail we have gleaned, and the larvae have never been documented (Johnson, 1995). 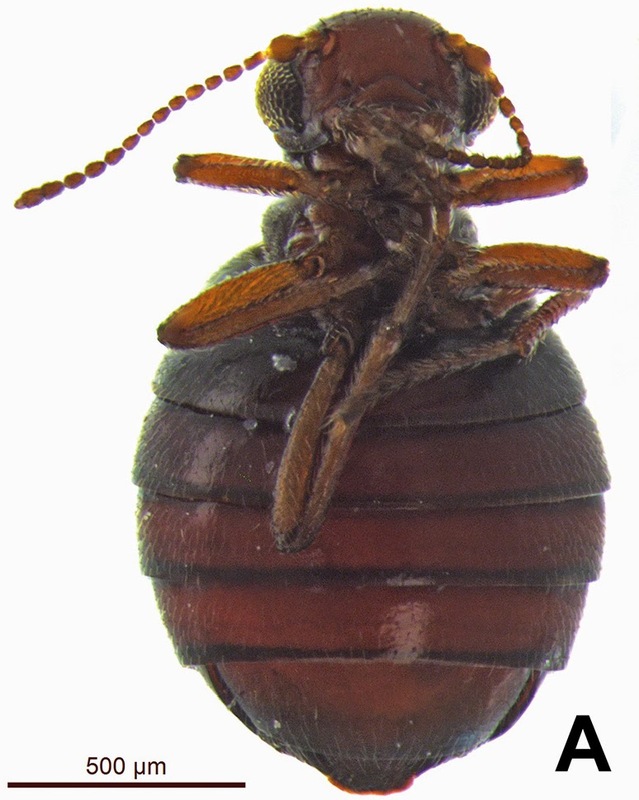 Eomeropids share earwigflies' retiring habits (Penny, 1975) and with cursorial, bristly limbs and sclerotized forewings are even more cockroach-like in their habitus (Peña, 1968): consequently, they are likewise an enigma. A single extant species (Notiothauma reedi) has been described, restricted to southern Chile in close association with forests dominated by southern beech (Nothofagus sp.) (Willmann, 1981); studied gut contents were botanical in origin (and in life the species is demonstrably fond of oatmeal; Byers, 1965), corroborating the seemingly herbivorous function of their mouthparts (Hepburn, 1969): pig carcasses deposited for forensic studies are also on the menu (Albornoz et al., 2015). Much like the Meropeidae, larvae of N. reedi remain unknown (Rebolledo et al., 1990). 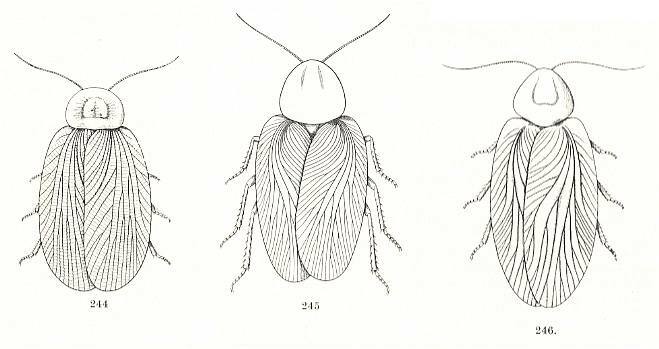 The ethological parallels between this pair of aberrant taxa have (naturally) led systematists to speculate that they might comprise a clade (Tillyard, 1935; Grimaldi & Engel, 2005), together forming a sister-group (Protomecoptera) to the remainder of the order (Eumecoptera) (Hennig, 1953): this hypothesis was based principally upon commonalities in meropeid and eomeropid wing venation (Riek, 1953), and was supported by reasoning that, given their cucaracha-like appearance, "protomecopterans" veritably constituted an evolutionary link between the holometabolous Mecoptera and the hemimetabolous assemblage of roachoids ("Blattoptera") (Crampton, 1930). While this imputed link to the likes of the Archimylacridae (see above) is certainly erroneous (the Endopterygota—of which the Mecoptera are a part—is most akin to the Paraneoptera; Kristensen, 1991), both families are undoubtedly ancient: earwigflies were present during the middle Jurassic in Siberia (Novokshonov, 1995) and mid-Cretaceous Burma (Grimaldi & Engel, 2013); four different eomeropid genera existed across eastern Asia and western North America in the Jurassic and Paleogene periods (Archibald et al., 2005; Zhang et al., 2011). The even-more-antiquated Thaumatomeropinae is delimited to several species known from the mid-Triassic of Kyrgyzstan and was, on occasion, classified in both of the taxa under consideration here (Rasnitsyn, 1974; Willmann, 1981), but deserves family rank. 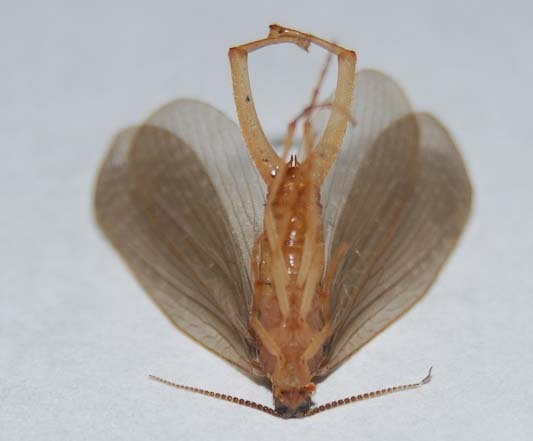 Holistic consideration of eomeropid characteristics is suggestive of that family's inclusion within the clade Pistillifera (all Mecoptera exclusive of Boreidae and Nannochoristidae), since the perceived similarities that united the protomecopteran taxa were plesiomorphies (Mickoleit, 1971; Willmann, 1981; Friedrich et al., 2012). This leaves earwigflies hanging loose: the Meropeidae may either be nested well within the Pistillifera, the sister-group to the remainder of that clade (Friedrich et al., 2012), or perhaps even the basalmost twig of their order (Penny, 1975). In all likelihood, meropeid phylogeny will remain opaque until more data is acquired—anything concerning the ever-elusive larva would be especially useful. †Heavily compressed, sclerotized, and lacking abdominal prolegs, as in the larvae of Elateridae (click beetles). ‡Rearward-oriented (with reference to mouthparts). §A basal posterior lobe of an insect forewing. Beutel, R. G.; Friedrich, F.; and Whiting, M. F. (2008). Head morphology of Caurinus (Boreidae, Mecoptera) and its phylogenetic implications. Arthropod Structure & Development, 37, 418-433. Beutel, R. G.; Zimmermann, D.; Krauß, M.; Randolf, S.; and Wipfler, B. (2010). Head morphology of Osmylus fulvicephalus (Osmylidae, Neuroptera) and its phylogenetic implications. Organism's Diversity & Evolution, 10, 311-329. Byers, G. W. (1973). 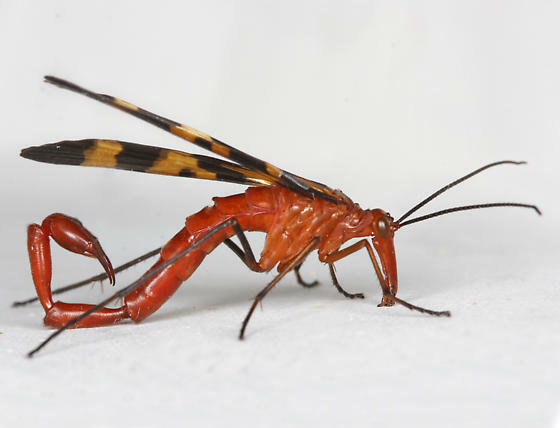 Zoogeography of the Meropeidae (Mecoptera). Journal of the Kansas Entomological Society, 46(4), 511-516. Crampton, G. C. (1930). The wings of the remarkable archaic mecopteran Notiothauma reedi McLachlan with remarks on their Protoblattoid affinities. Psyche, 37(1), 83-103. Hepburn, H. R. (1969). The proventriculus of Mecoptera. Journal of the Georgia Entomological Society, 4, 159-167. Hinton, H. E. (1981). Biology of Insect Eggs. New York: Pergamon Press. Johnson, N. F. (1995). Variation in male genitalia of Merope tuber Newman (Mecoptera: Meropeidae). Journal of the Kansas Entomological Society, 68(2), 224-233. Mickoleit, G. (1971). Zur phylogenetischen und funktionellen Bedeutung der sogenannten Notalorgane der Mecoptera (Insecta: Mecoptera). Zeitschrift für Morphologie der Tiere, 83, 483-496. Novokshonov, V. (1995). Der älteste Vertreter der Meropeidae (Mecoptera, Insecta). Palaeontologische Zeitschrift, 69, 149-152. Peña, L. E. (1968). Natural history notes on Notiothauma. Discovery, 4, 42-44. Penny, N. D. (1975). Evolution of the extant Mecoptera. Journal of the Kansas Entomological Society, 48(3), 331-350. Rasnitsyn, A. P. (1974). Taxonomic names, in New Mesozoic and Cenozoic Protomecoptera. Paleontological Journal, 8, 493-507. Rebolledo, R. R.; Alda, L. L.; Gutiérrez, M. S.; and Guiñez, B. S. (1990). Antecedentes biológicos de Notiothauma reedi MacLachlan (Mecoptera: Eomeropidae) en el Monumento Natural Cerro Ñielol (Temuco, Chile). Revista Chilena de Entomología, 18, 25-28. Riek, E. F. (1953). Fossil mecopteroid insects from the Upper Permian of New South Wales. Records of the Australian Museum, 23, 55-87. Sanborne, P. M. (1982). Stridulation in Merope tuber (Mecoptera: Meropeidae). The Canadian Entomologist, 114(3), 177-180. Simiczyjew, B. (2002). Structure of the ovary in Nannochorista neotropica Navás (Insecta: Mecoptera: Nannochoristidae) with remarks on mecopteran phylogeny. Acta Zoologica, 83, 61-66. Somma, L. A. and Dunford, J. C. (2007). Etymology of the earwigfly, Merope tuber Newman (Mecoptera: Meropeidae): simply dull or just inscrutable? Insecta Mundi, 13, 1-5. Tillyard, R. J. (1935). The evolution of the scorpion-flies and their derivatives (Order Mecoptera). Annals of the Entomological Society of America, 28, 1-45. Willmann, R. (1981). Phylogenie und Verbreitungsgeschichte der Eomeropidae (Insecta: Mecoptera). Ein Beispiel für die Anwendung der phylogenetischen Systematik in der Paläontogie. Paläont. Z., 55, 31-49. Wood, D. M. and Borkent, A. (1989). Phylogeny and classification of the Nematocera. In McAlpine, J. F. and Wood, D. M. (eds. ): Manual of Nearctic Diptera, vol. 3 (pp. 1,333-1,370). Ottawa: Agriculture Canada.